CUSTOM: Designed to fit the BOB Revolution FLEX & Stroller Strides Single Jogging Stroller. PIECE of MIND: Clear design allow parents to see child through peekaboo window. Hook and loop straps for added security on windy days. Ventilation holes for easy breathing. DESIGN: Elastic front provides a form fitting look and feel that does now allow wind or water to seep through. 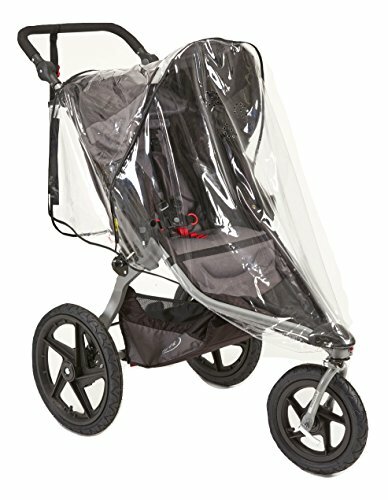 Maximum coverage to protect children from rain, wind and debris. HIGH QUALITY: Made from premium, high quality material to help avoid wear and tear from everyday use. Designed and produced in US. If you have any questions about this product by Sasha Kiddie Products, contact us by completing and submitting the form below. If you are looking for a specif part number, please include it with your message.